Today, two main types of printing methods stand; Litho and Digital. But what are the key differences between Lithographic Printing and Digital Printing? Litho printing splits the required image into 4 colours, Cyan, Magenta, Yellow & Black. These individual colours are then etched on to metal plates, that once installed into a printing press, transfer each colour ink in sequence to the printed stock. Therefore Litho printing requires an intermediate, such as plates in our case. This does, in theory, make the process longer than digital as there is this added extra involved. The quality and cost-effectiveness in high volume jobs is a big factor. While today’s digital presses are getting closer to the cost/benefit ratio of litho for high-quality work, they are not yet able to compete with the volume a litho press can produce. Any over printing work such as Letterheads require caution and cannot be done on our digital presses most of the time, to avoid any melting of inks during an overprinting process, our Litho presses eliminate this. If you’re planning to print using special spot colours like the Pantone® Matching System, litho printing will give you the best match, since it can use actual Pantone® ink. We use our litho presses for any spot colour work to produce accurate use of the Pantone® inks. Digital is more suitable for shorter runs whereas Litho for longer runs. Although the cost per sheet is higher using digital, this price is avoiding all the technical steps, time and personnel required to print Litho. 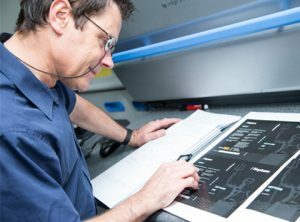 We can print directly from the file to the machine without the need for any intermediate, making digital printing quick and handy. The main advantage of Digital printing is the much shorter turnaround time. Digital machines use CMYK process colours only, unlike Litho. 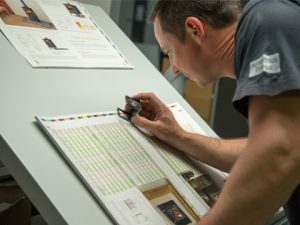 Here at Acanthus Press, we take advantage of both technologies so that we are able to pick the correct technology for each particular job depending on weight & type of stock, turnaround required, run length & quality required based on the original file supplied. Generally, you can hardly tell the difference between the two processes. We aim to always choose the correct process for the correct job, giving you the highest quality prints. Acanthus has 200 solar PV panels generating most of its power requirement without producing any further carbon dioxide emissions.